Haijunka board is a board structure often used for game developers in sequential development process. Interview with Charles Smith on how he applied Kanban to project management in health care system. Case study on how to organize and improve the efficiency of inbound marketing efforts using Kanban method. Interview with Colleen Reusche on the usefulness of Kanban board in a homeschool curriculum company. Insightful story of Matthew Moran about managing the interview procedures using online Kanban board. Interview with Rik Mols on improving the delivery time of Web designs and customer satisfaction with Kanban. Use case that explains how do we use Kanban board to mange sales and distribution of Kanban Tool On-Site. Interview with Philip Yates on managing processes and projects while developing breakthrough technology systems. The example on how Kanban Tool software development team uses Kanban board with time tracking and time reports. 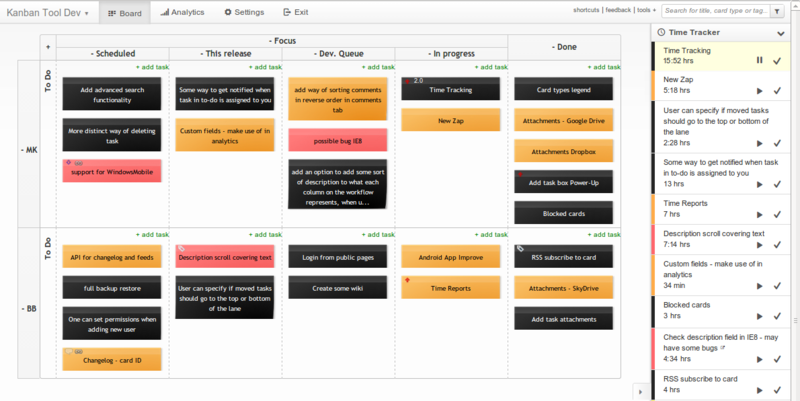 Case study on managing and organizing Support Team activities on Kanban boards. Case study on maintaining and implementing software at Geneva Airport ITC Department using Kanban boards. See how Line Bering and her Team manage their web development and smaller jobs in Kanban Tool. In-depth story of Kanban used to aid work at a metal sheet processing manufacture. Client leads management from contact to retention. Do you have an interesting Kanban board use case to share? Tell us your story. We love to hear about it and please contact us if you need any help.